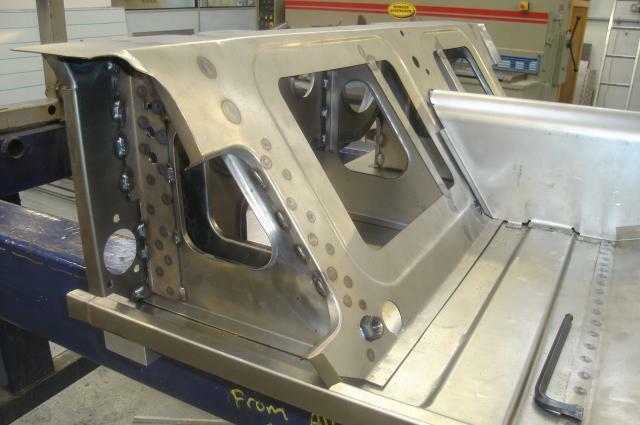 Ordered August 2009, construction of GEL – W 002 has just started. 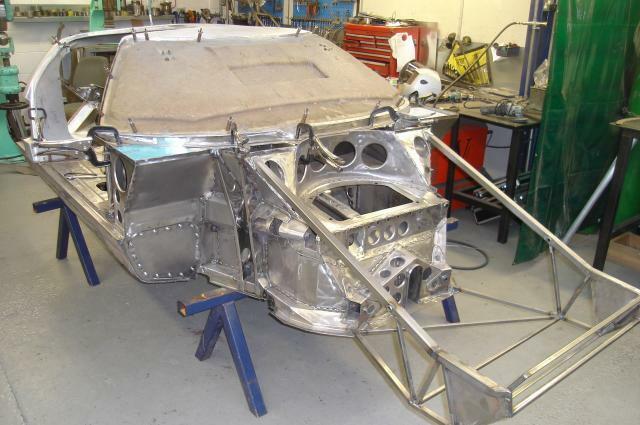 Based on a late spec race car with an Aluminium Roof this car will be used for endurance racing in France. 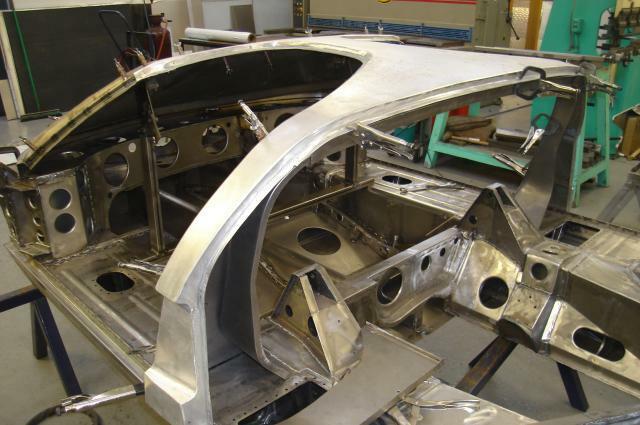 Please keep logging on as the Chassis takes shape… as with our current project GEL 003 we will update this page on a regular basis. 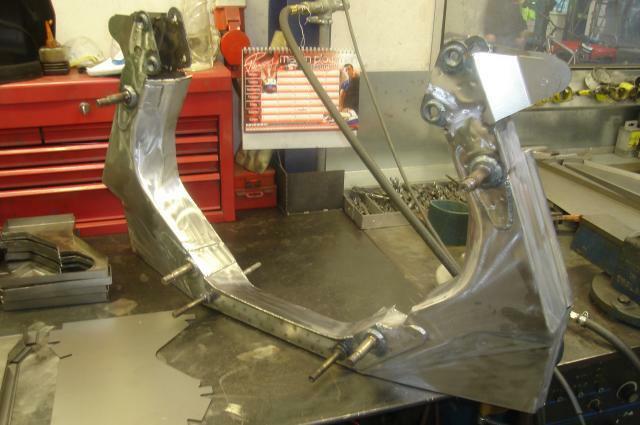 The rear Gearbox Hoop, fabricated in it’s own sub jig, is ready to install into the main Chassis construction jig. 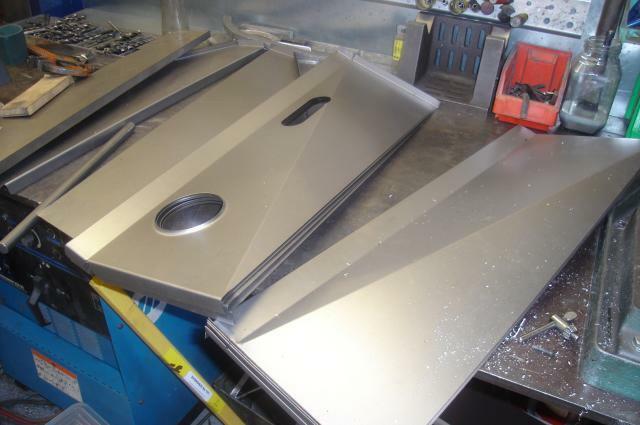 Further Panels are cut and folded into shape ready to be welded into the Chassis. 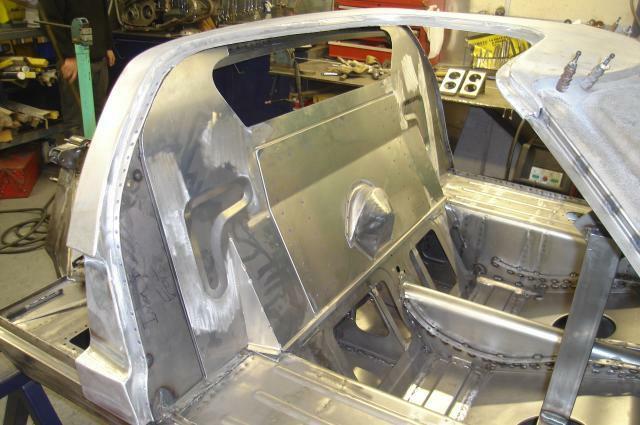 Rear Pontoons are located into the main Jig and mounted to the Seat back Bulkhead. 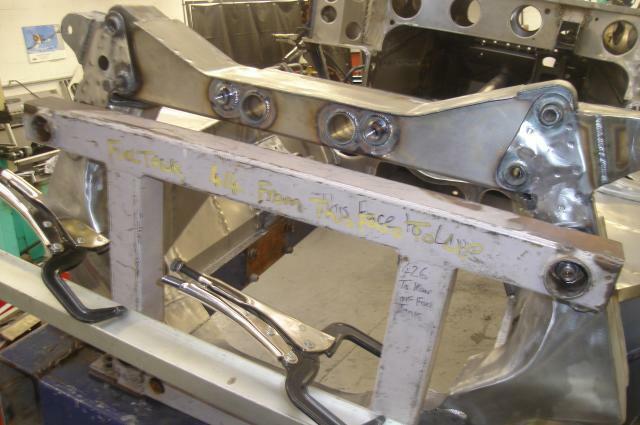 The front Suspension Pick ups are fabricated and place into the front Jig structure. 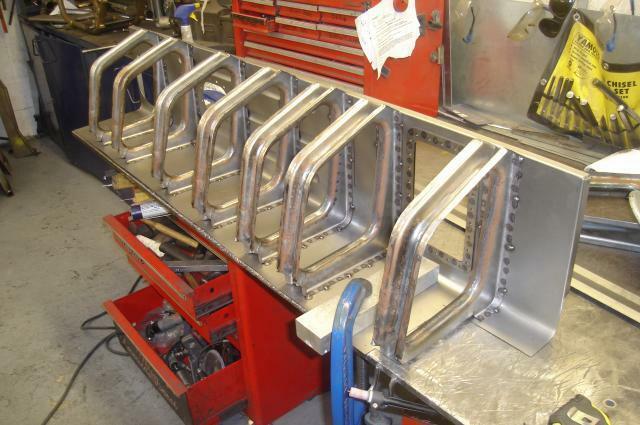 With the front end nearly finished the Petrol filler Tubes are built up and are ready to be fitted. W standing for Weslake, wide Body. 002 being the 2nd in the production run. 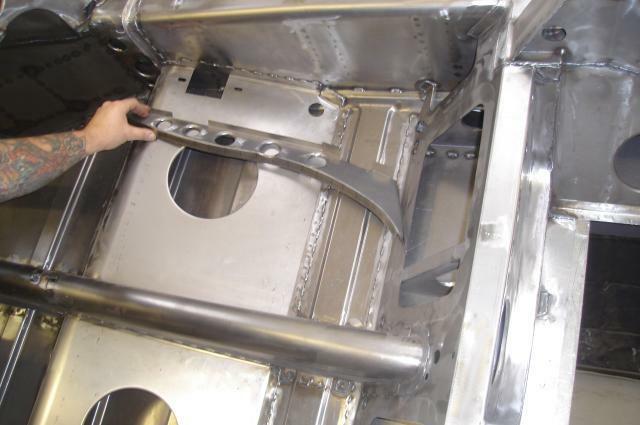 The dummy Pedal Box casting is placed into the Chassis to check for clearence. 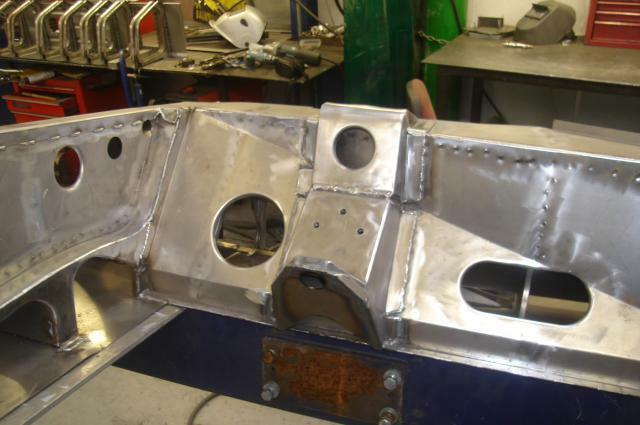 Engine Mountings are welded into place ready to install the dummy Engine and Gearbox. 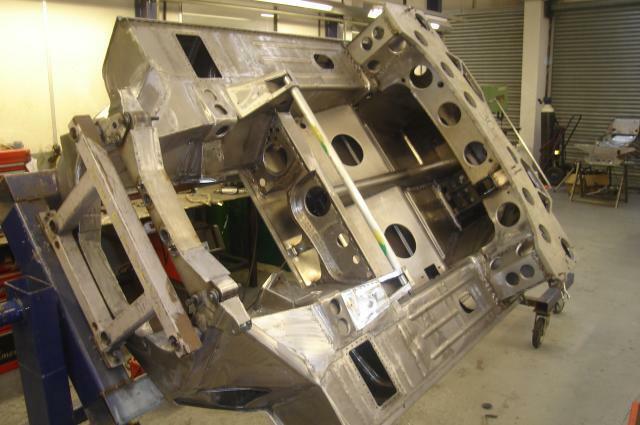 The outer Sills are laid up ready to be jigged into the Chassis. 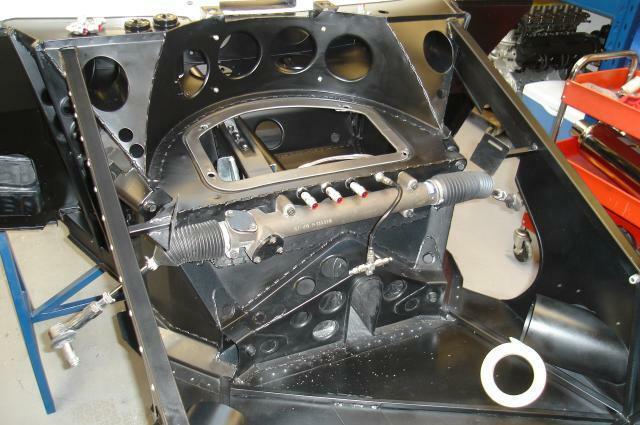 The top and bottom Steering Column Mountings are attached to the front section. 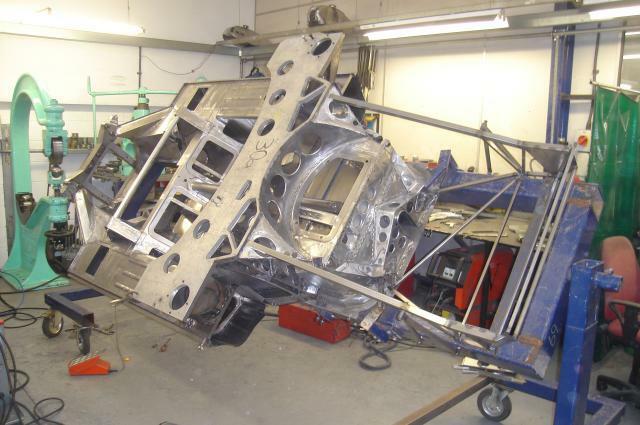 Top Gearbox Frame is produced and fitted to the Jig. 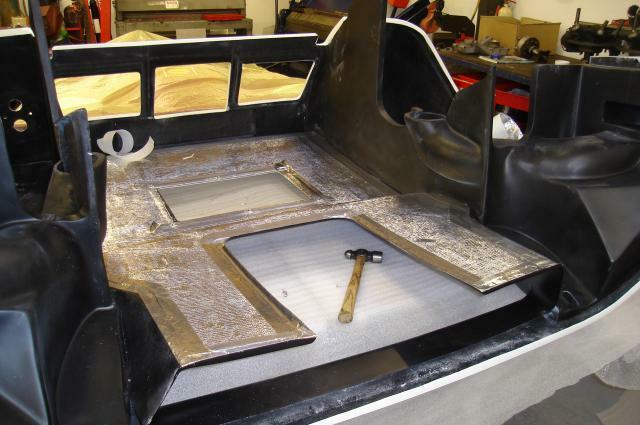 With the main structure nearly finished the alloy Roof can now be fabricated. 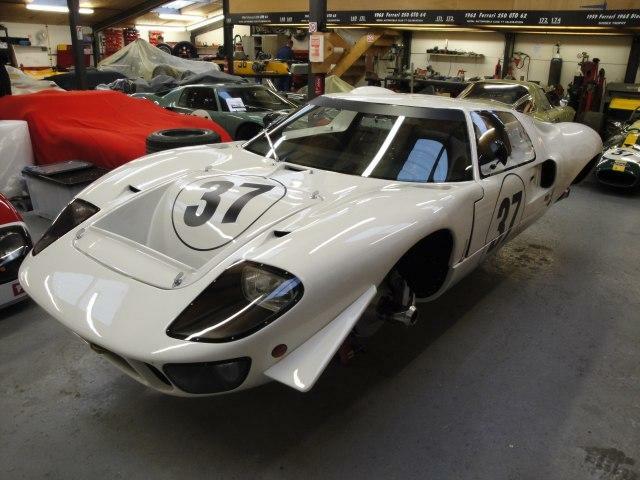 Only the late run of GT40s had the light weight Roof. 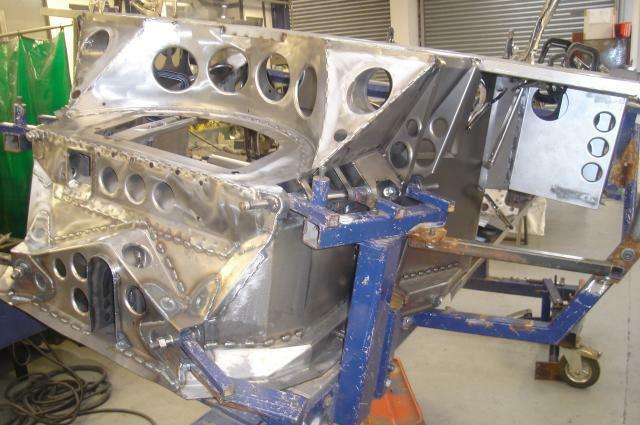 Once the Roof is installed onto the main Hull, it can be released from the Jig and the next Chasiss placed into the 360 degree rotating Frame. 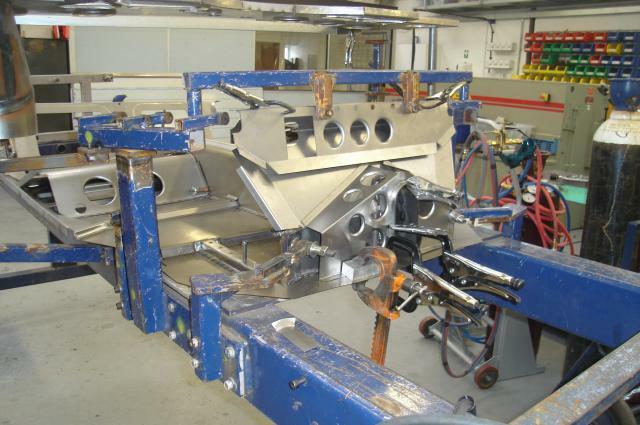 The fully rotating Jig allows work to be carried out inside and outside the Chassis, ensuring it’s fully complete before removal. 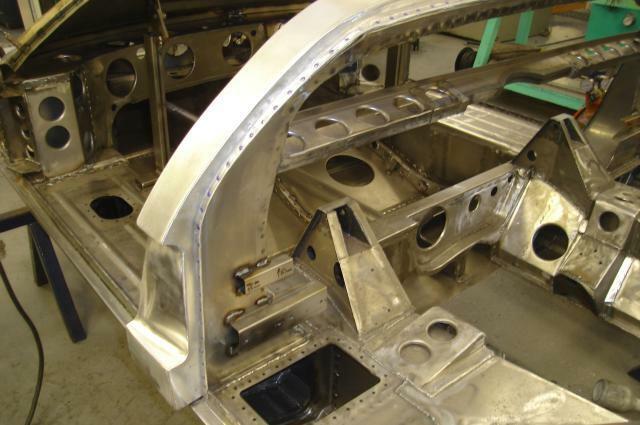 Seat Rails are offered into the Chassis, these , along with the last few small details should see the the main Chassis finished in the next few days. Work on the light weight Roof has begun with a finish date for the end of October now in sight. 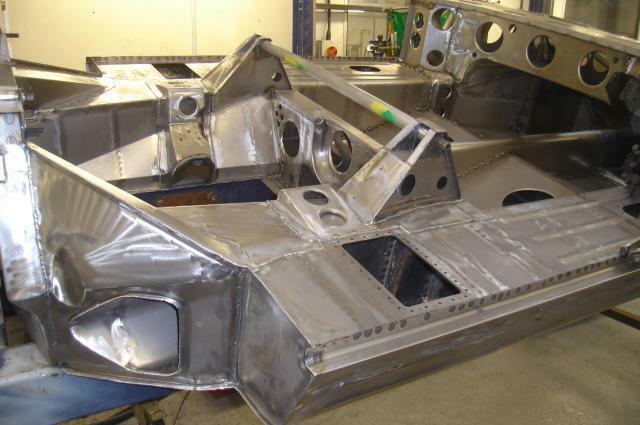 The alloy Roof now takes shape as it’s trial fitted to the complete Chassis. 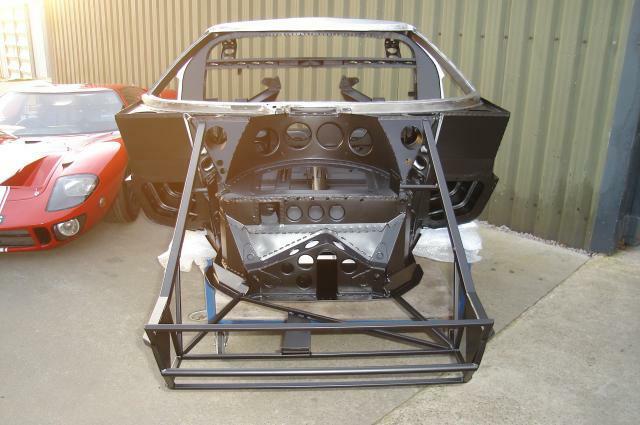 By the end of the week the Chassis should be complete and ready for the dry build, prior to being powder coated. 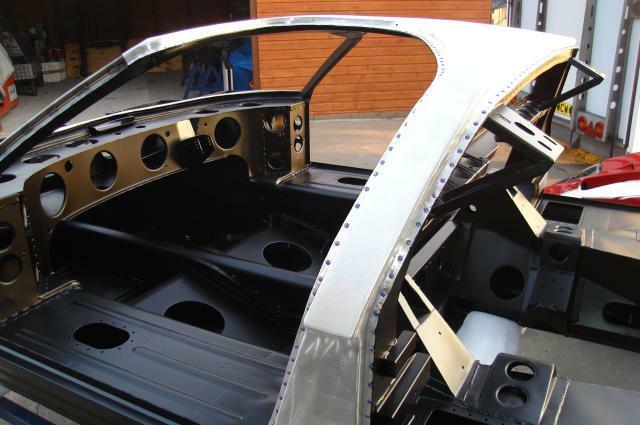 Original style solid Rivits used to fix the alloy Roof to the steel inner. 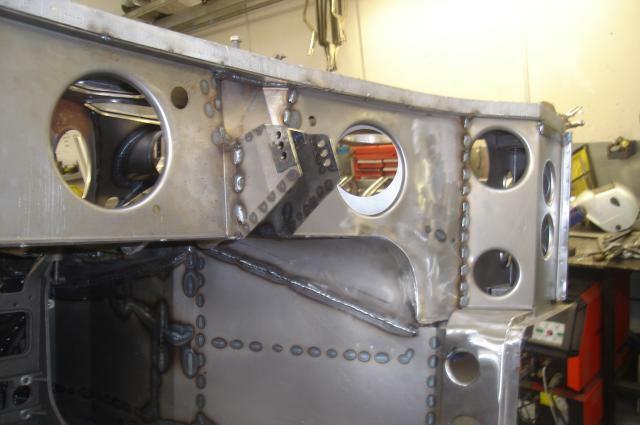 Fuel pump brackets fitted to the back of the roof section. 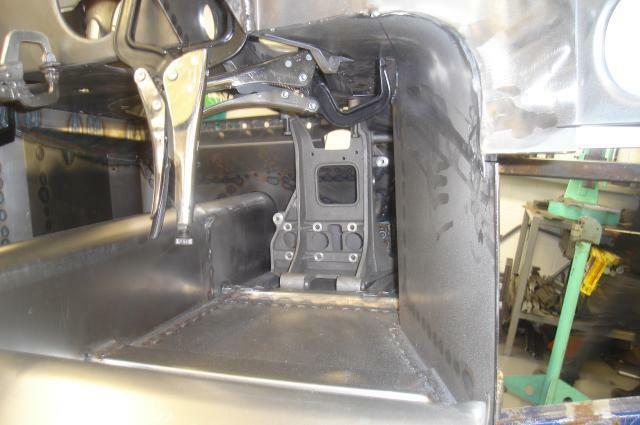 Rear bulkhead panel is made and drilled off. 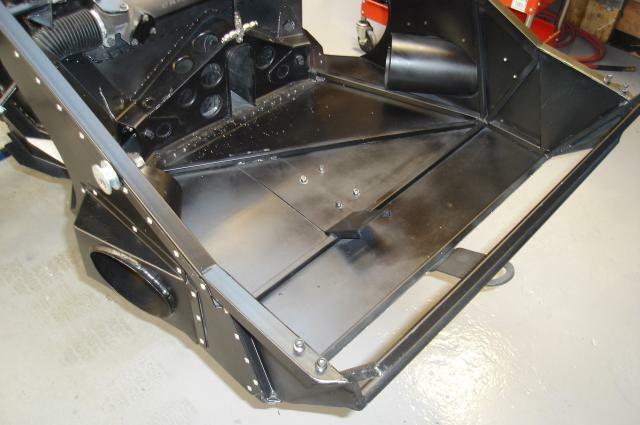 The finished, painted Chassis ready for build. 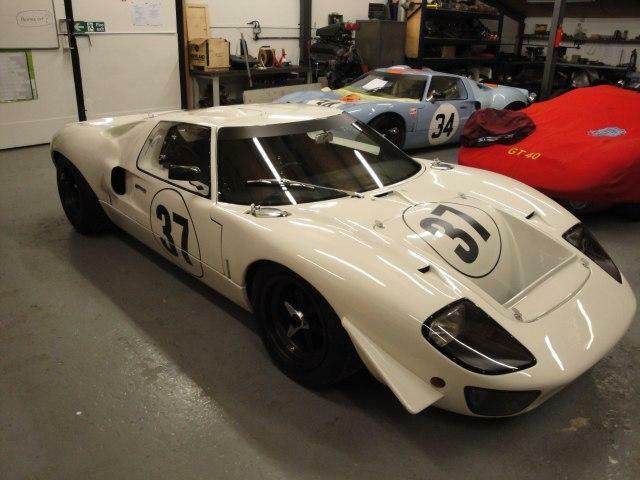 GEL W 002 sits along side GT40 P 1089 which has just had the Engine and Gearbox re fitted ready for next season. 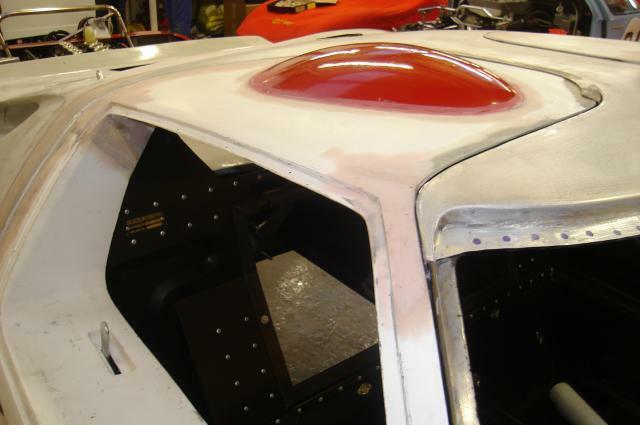 Ally Roof ready for the white Ford France paint work. Pedal Box built up, ready for installation. 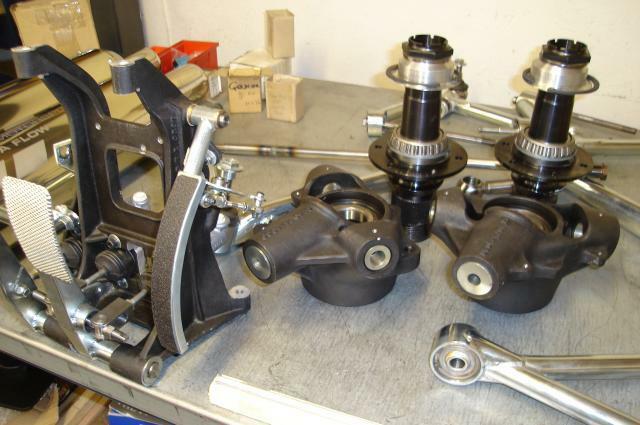 Pre built Suspension units constructed whilst the Chassis was being painted, await fitment. 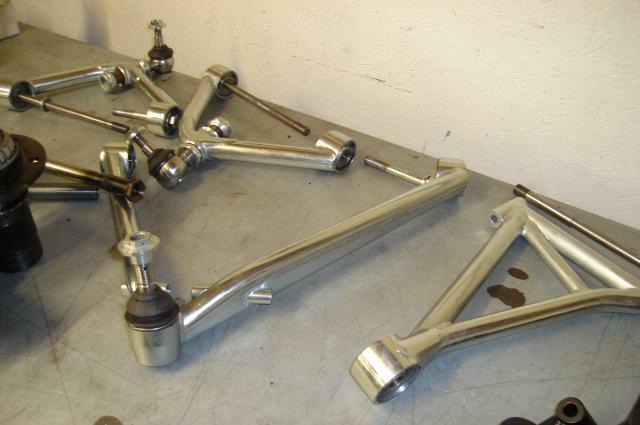 Gear Lever and Hubs all intended to be used on this latest project. 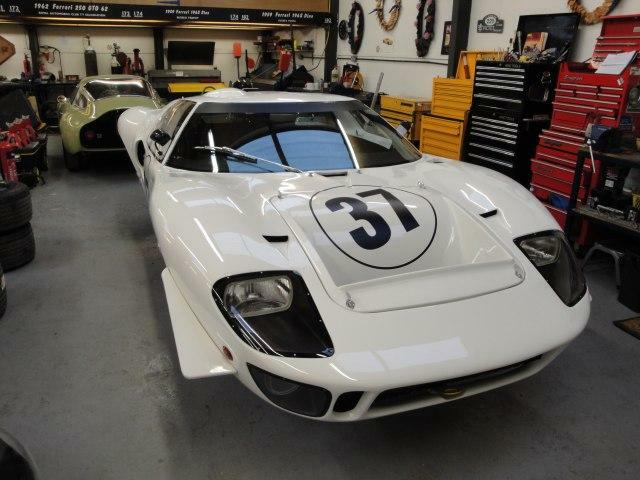 Back from the bodyshop with it’s pre fitted new wide arch body, the aero flips are fitted to the front end. The new owner will need extra room above his head so a period bubble is shaped into the door. 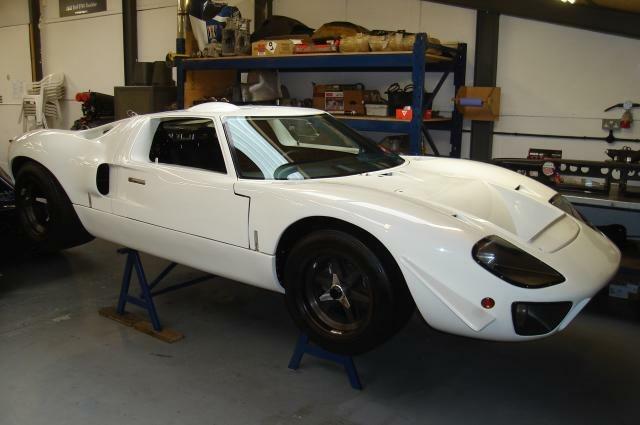 Due for paint this week and returned to Gelscoe by Christmas allowing us to build the car over the holiday period. Fresh back form paint, construction starts on GEL W 002. 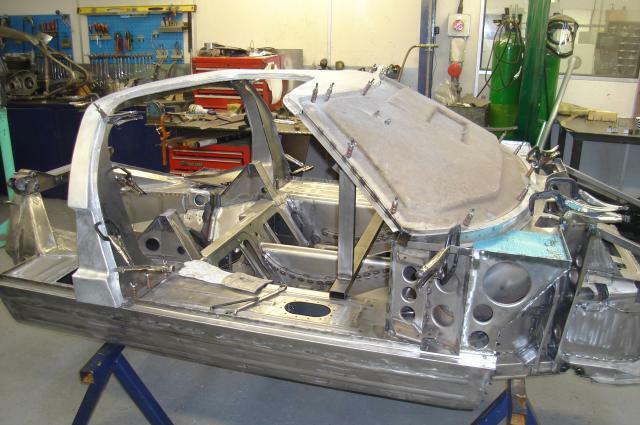 With a deadline for the end of Jan 2010 to meet, the whole workshop will be working over the Christmas break. 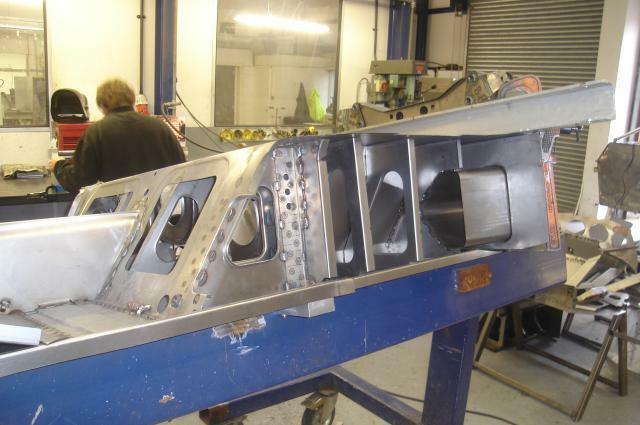 Front brake duct tubes are fitted to the nose panels. 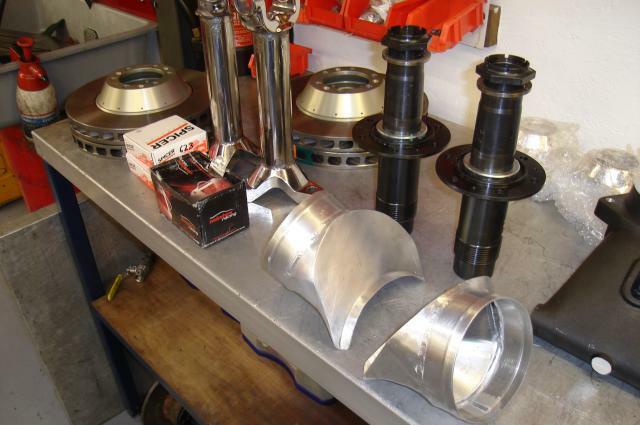 These will couple up to the upright ducts via flexy pipe. 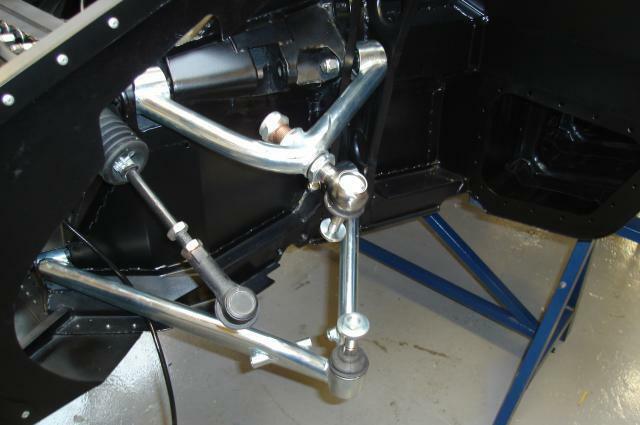 Steering rack is fitted into place, before the brake pipes are installed on the front bulkhead. 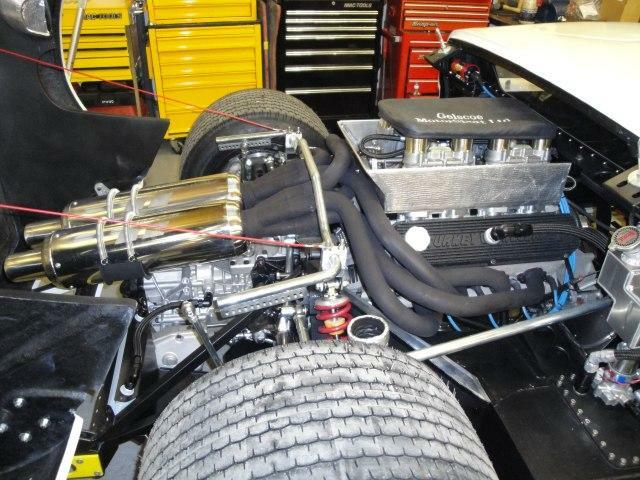 Heat management will play a major roll in this build as the owner intends only to race in endurance events. 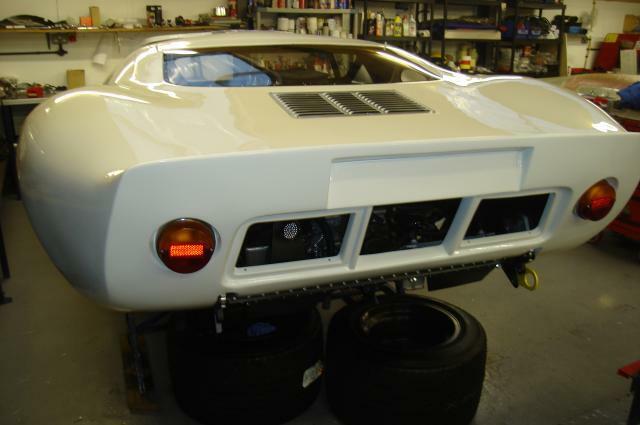 Heat build up is a big problem with GT40s, the seat back panel tends to soak up heat from the exhausts. 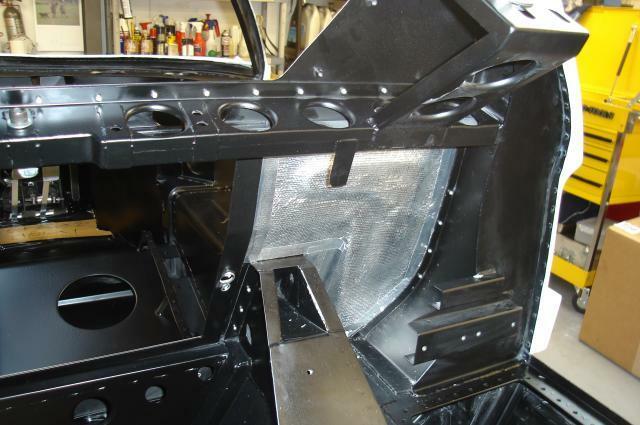 The now painted rear body section has the heat proof material fitted to it’s under side. 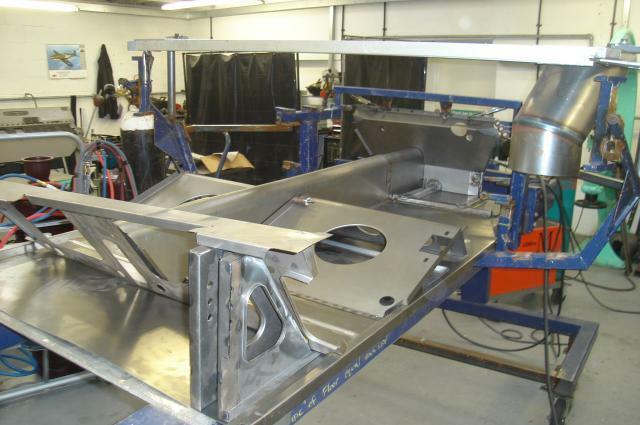 Rear suspension is fitted into place, ready to accept the pre built uprights. 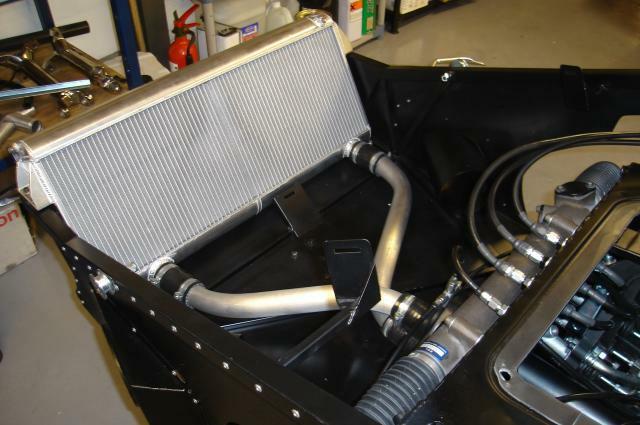 Water radiator and pipes are fitted into place, along with the brake fluid delivery pipes. 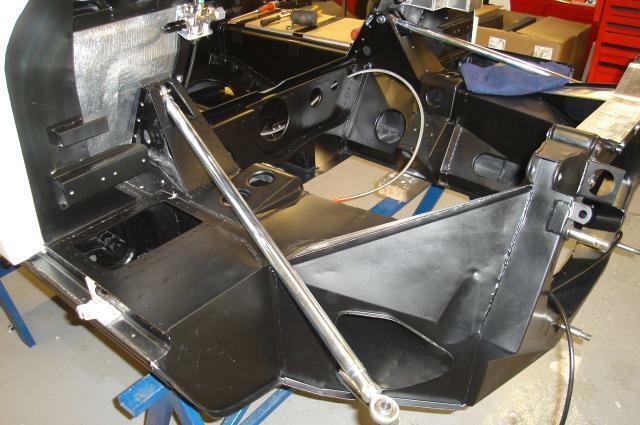 Front suspension is fitted into place, ready for the completed upright. 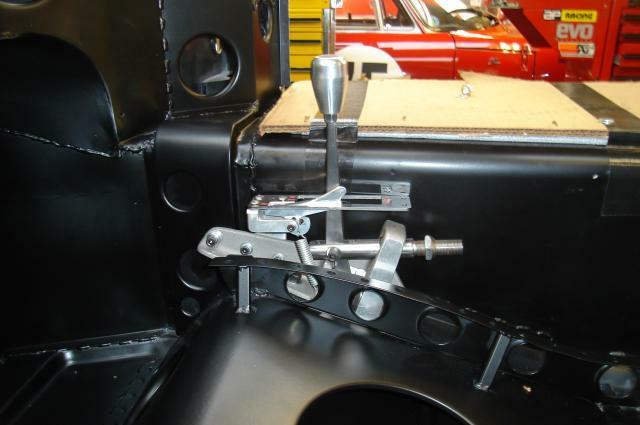 Completed gear lever assembley is bolted in, the fabricated section can now be made. 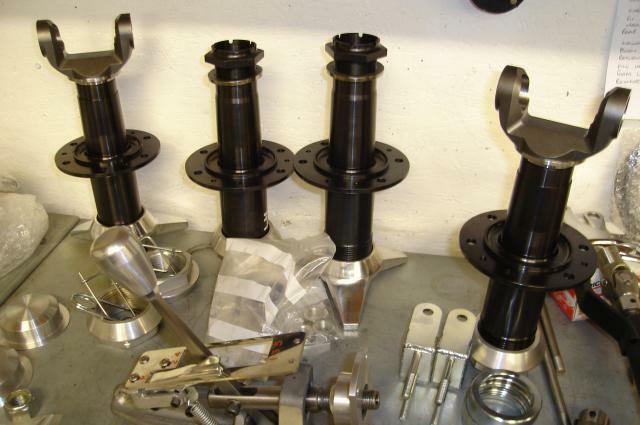 Front upright kits, prior to being built up. 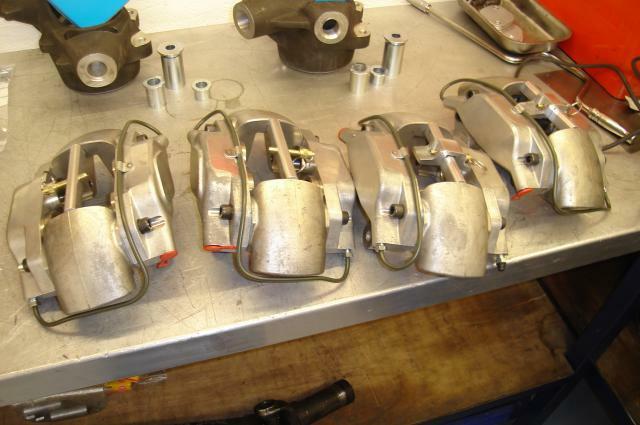 Late spec four piston GT40 brakes to suit the vented disc. 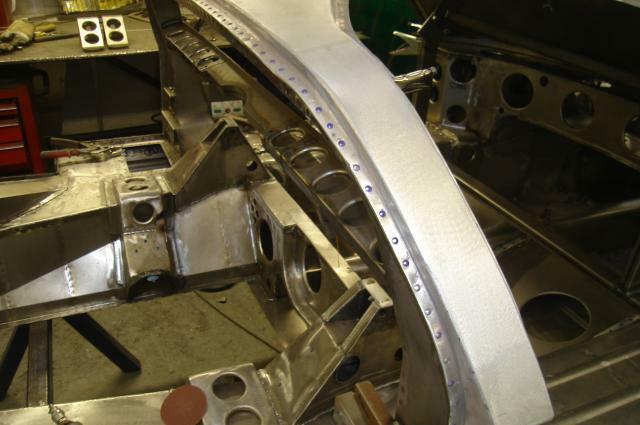 Vented discs and brake ducts ready to be fitted to the completed front uprights. 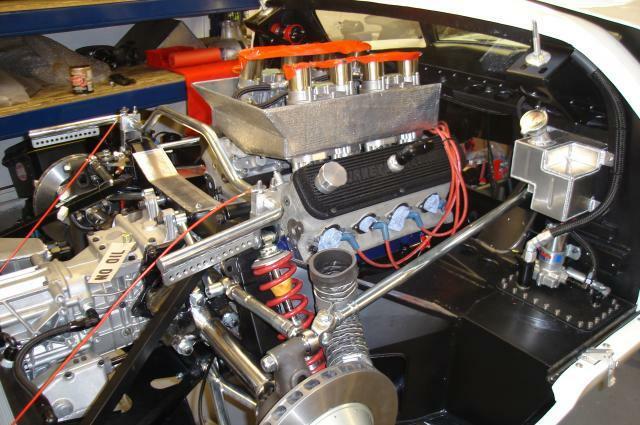 With the engine on the dyno the gearbox is trial fitted to the chassis. 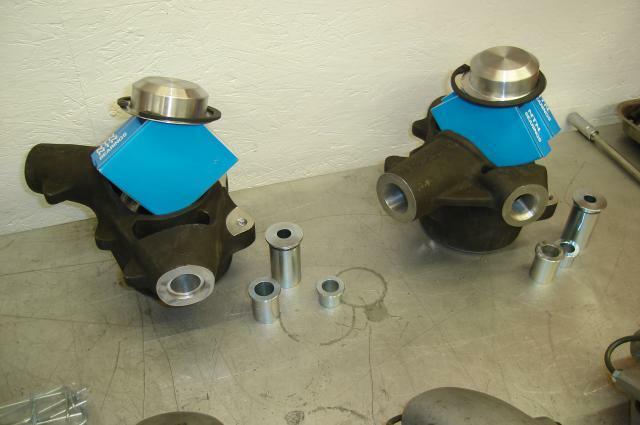 The oil cooler pipes can be constructed and gear linkage fabricated. 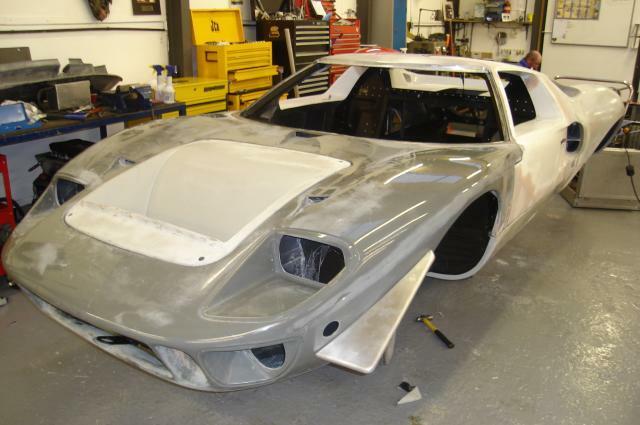 The body now painted, head light, spot light and side window perspex is fitted. 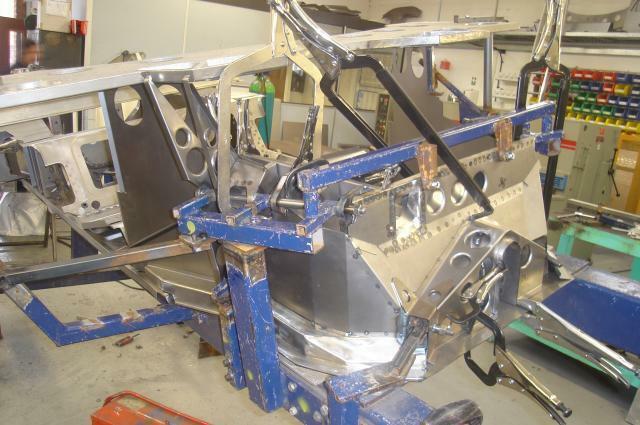 Once the nose and tail are fully built up the wiring loom is installed in each item. 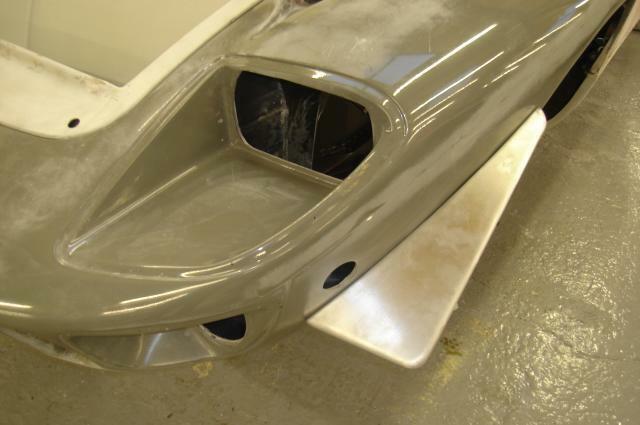 With as many as five members of staff working on the car at any one time over the Christmas break, GEL W 002 has begun to take shape. 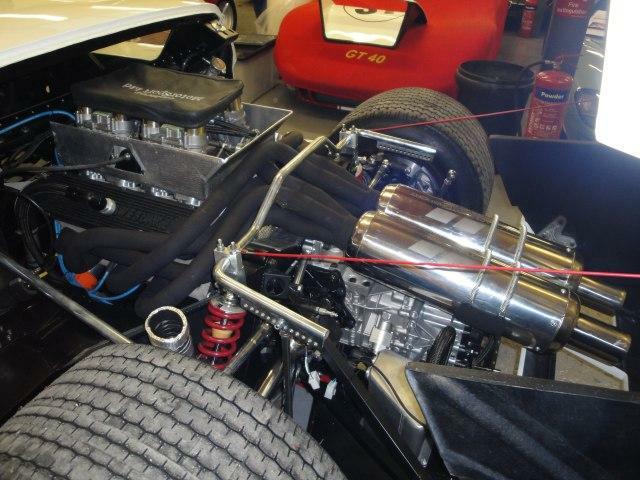 Engine is due back first week of Jan, so a double shake down with GEL 003 at Mallory Park looks more than possible. Happy new year to the owner of GEL W 002 ….. a great effort from the Gelscoe staff over the Christmas break, it’s well on the way to completion. 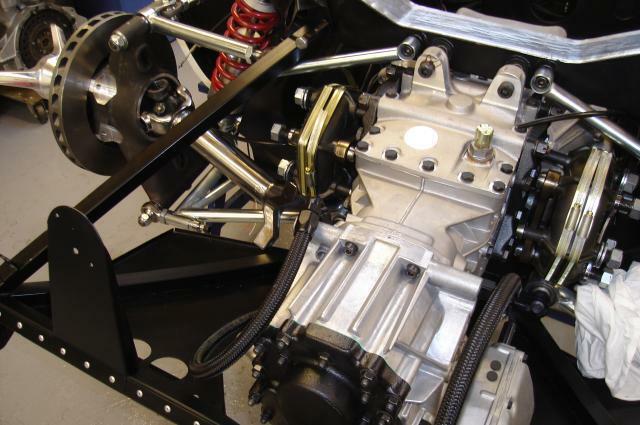 Drive shafts are fitted up to the Gearbox and the pre built up oil cooler system is installed. Period aero flips are added to the nose along with the lights and perspex covers. 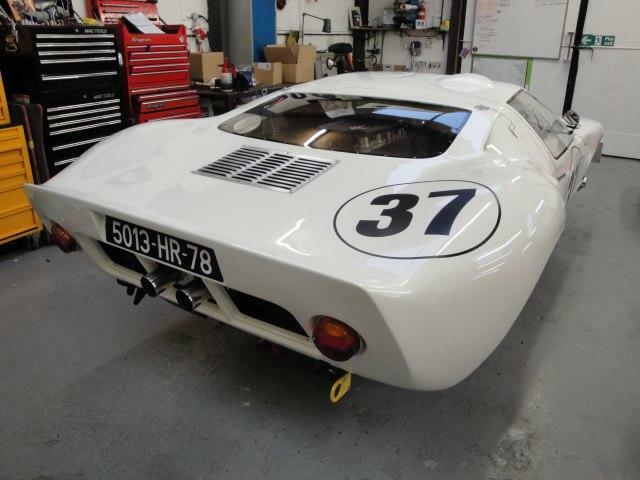 Tail built up with rear window , grill and rear lights. 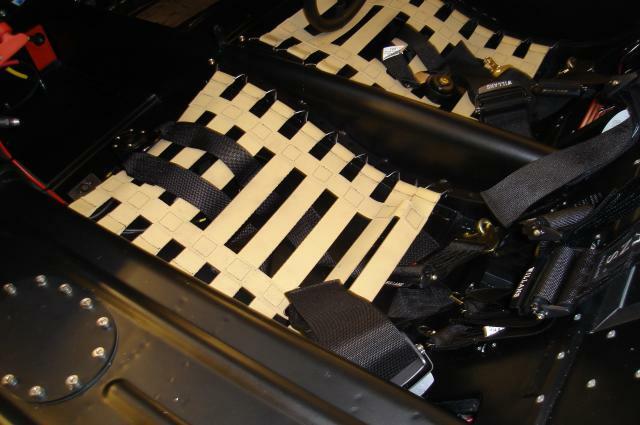 Under seat webbing as used in period, the very early GT40 seats had pump up bags to aid driver comfort, soon made obsolete. 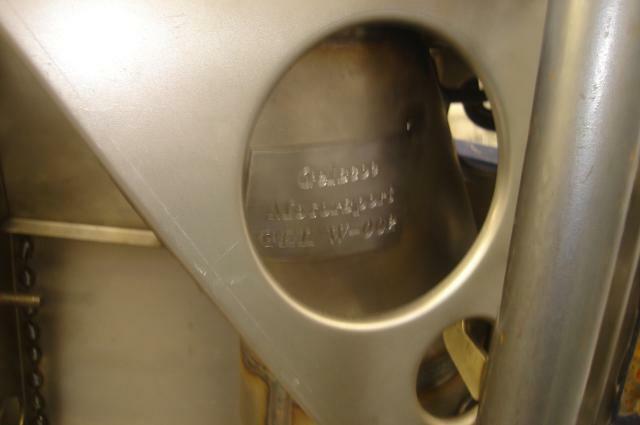 Even the original number plate is re created to give that finishing touch to the rear clip. Only a matter of hours away from being finished… GEL W 002 is completed 5 weeks ahead of the delivery due date. 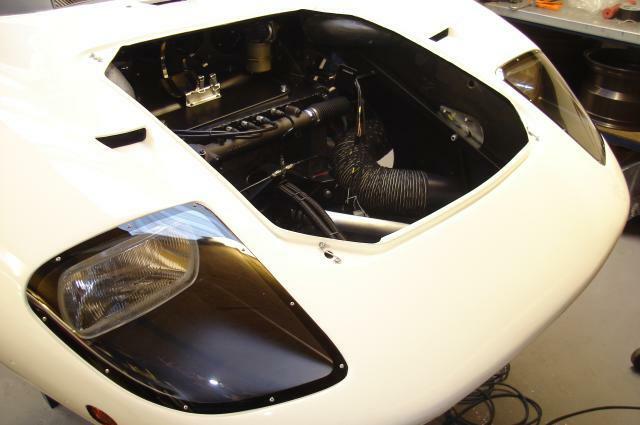 Due to noise regulations in V de V endurance events two large silencers have been fitted. 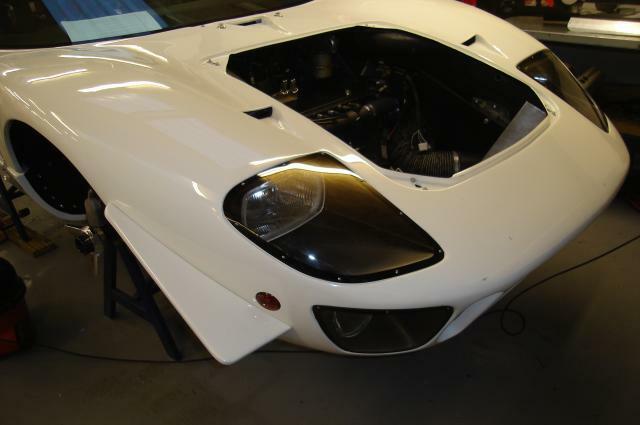 Due to test on the 30th Jan at Silverstone … 4 weeks early !. 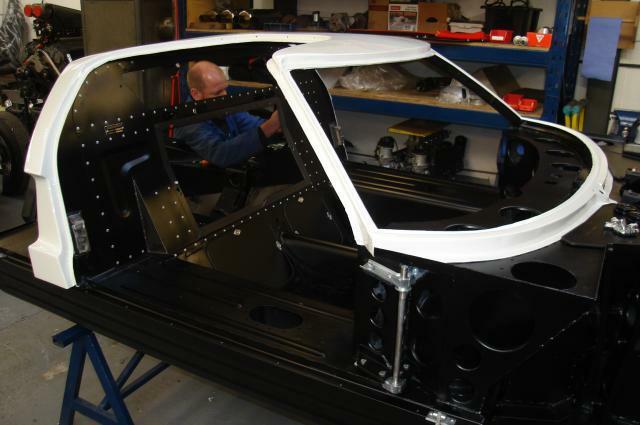 The finished car ready to test. Tested on 29th Jan 2010 .. Bruntingthorpe, 5 weeks early.